The Cincinnati Art Museum has been collecting Islamic calligraphy since the 1940s. These sumptuous works, with precisely articulated scripts that grace the page, explore the prominence and pervasiveness of calligraphy in the arts of the Islamic world. Richly illuminated folios from poetic and historic manuscripts will be displayed alongside pages from the Qur’an, calligraphic practice sheets, and political decrees in Collecting Calligraphy: Arts of the Islamic World. Through the display of individual folios and complete manuscripts that date from the ninth through the twentieth century, the exhibition emphasizes the craftsmanship and skill evident in each work’s creation. 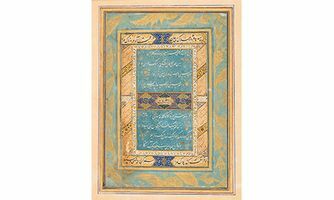 One can appreciate the symbiotic balance between paper size, script, ornamentation, and illumination in works that originate from a myriad of countries; including Iran, Turkey, India, Spain, and Syria. Discovering Islamic calligraphy through this collection reveals how the art of the book functioned as a vehicle to convey knowledge, disseminate the word of God, and legitimize empire. Collecting Calligraphy celebrates a recent gift from JoLynn and Byron Gustin, Cincinnati residents and active museum patrons. This significant gift adds to our strengths in the calligraphic arts, an artform long prized by Islamic cultures and which has flourished from the seventh century through the present. The temporary exhibition will be on view in The Manuel D. and Rhoda Mayerson Gallery and Sara M. and Michelle Vance Waddell Gallery (G124 and 125), across from the museum’s Terrace Café. Free admission. Photography is permitted.